We love the flavors of the east and to honor our love we create inspired recipes. 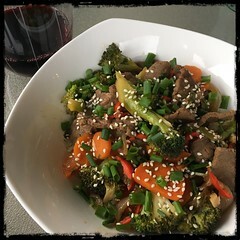 For this dish, we take beef and broccoli and add typical flavorings for our creation. Simply delicious. 1. Marinate beef as you make the rice. Remove the meat from the marinade, use a strainer to allow the liquid to drain off. (Reserve the marinade). 2. In a large pan or wok, heat 2 tbsp of avocado oil and 1 tbsp of sesame oil. Fry the onions and garlic. 3. When the onions begin to soften, add the drained beef (reserve the marinade). While in the pot, season a bit with a bit of white pepper. 4. When the beef is browned, toss in the carrots and mix well. Let cook for about 3-5 minutes or so. 5. Add the cup of beef stock and let it come to a boil before adding the reserved marinade. 6. Once it returns to a boil again, add the broccoli flowerettes, cover and let cook. 7. When the broccoli becomes tender, toss in the fresh cilantro, lime juice and sliced hot peppers. Mix well and remove from stove. 8. Serve over rice and garnish with green onion and sesame seeds.